Wright became aware in Dec 2012 media reports questioning the legitimacy of Duffy's expenses. But he didn't see he need to get involved at that point. When, a few months later a story about Duffy obtaining a PEI health card caught his eye. He spoke to Senator Tkachuk - the chair of the senate steering committee - and Tkachuk said he thought there was a problem with Duffy's expense claims. The claims were sent to be audited, along with the claims of Senators Brazeau and Harb. Duffy indicated to Wright that he shouldn't be included with the other two because he saw them they had done something wrong and he had not. He characterized the Senate residency form he had to fill out as a 'trap'. It made some sense to Wright. The binder of emails includes everyone he could find. He did it over the long weekend of his departure from PMO. Before Eright left PMO he was aware ethics commish would be looking at things so he went through his email, searching for words like Duffy and Senate and then compiled a bunch of emails. He did get some assistance from PMO on that. He subsequently offered it to the RCMP as well. He wanted to provide them with any information he had because he knew they might be looking into him as well. Wright says he devoted a minuscule amount of his time on the Duffy issue over 3 months. In discussion with Duffy, Duffy did admit to Wright he spent more nights in Kanata than PEI. Mostly he'd be in PEI in the summer and if he wasn't there he was travelling on senate business. Wright expressed his view that in a common sense view his home in PEI was not his primary residence. He understood there was a problem with the definition of the Senate rules. At the end of the discussion Duffy agreed to repay the $32,000 but wanted to make sure he could still constitutionally represent PEI, which Wright saw as no problem. Duffy also wanted the residency issue to be communicated as being caused by a lack of clarity in the Senate rules. Wright agreed. Wright went over all of that with Tkachuk. The following caucus meeting Wright saw Duffy discussing something with the Prime Minister. 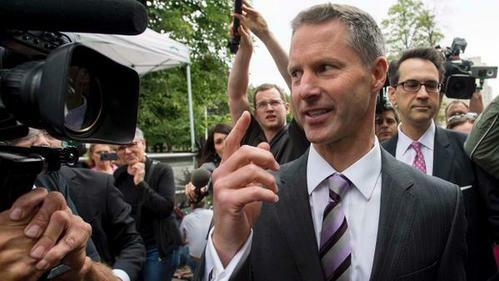 Wright interjected himself into the conversation where Duffy was making his case to the PM. After Duffy was done Wright gave his view to the PM that on a common sense understanding Duffy 'hung his hat' in Kanata and that's where his home was so t was inappropriate for him to claim travel expenses where there. He said Duffy should repay. The PM agreed because Duffy was not incurring additional costs while in Kanata. Wright took it that Duffy agreed or accepted the PM's view. Later that night though, Duffy sent Wright an email with points from his lawyer. What caught Wright's eye was a series of alternative outcomes. One of which was Duffy would acknowledge the mistake, repay living expenses, but have legal fees covered for him. Wright did not know in advance that Duffy would try to speak to the PM at the end of the Feb 13 caucus meeting. Neubauer asks about the tone of the conversation and Wright characterizes it as a business conversation between people with different points of view. No voices were raised and there was no aggressive tone, although Wright says Duffy is more animated in general. He said there was something at stake, so that could be seen from he conversation but that was about it.